May I Answer That ? 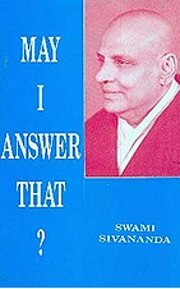 The questions and answers in this book deal with some of the commonest, but most vital, doubts raised by practicing spiritual aspirants. What invests these answers and explanation with great value is the authority, not only of the sage's intuition, but also of his personal experience. This priceless volume is the outcome of Seva Bhav of the great master. Sri Swami Sivananda , born on the 8th September, 1887, in the illustrious family of Sage Appayya Dikshita and several other renowned saints and savants, Sri swami Sivananda had a natural flair for a life devoted to the study and practice of Vedanta. He was an inborn eagerness to serve all and an innate feeling of unity with all mankind. He is the author of over 300 volumes and has disciples all over the world, belonging to all nationalities, religions and creeds. To read his works is to drink at the Fountain of Wisdom Supreme. On 14th July, 163 he entered Mahasamadhi. Title: May I Answer That ?